Macron’s France Seized Climate Leadership! 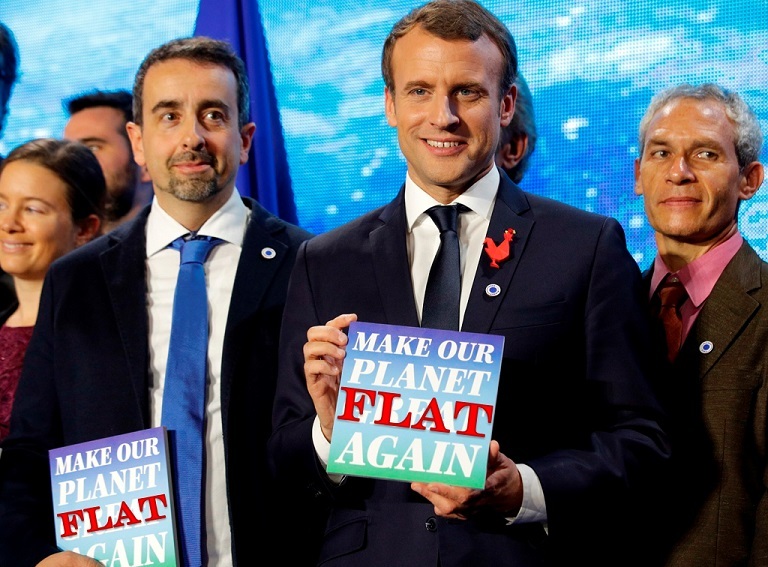 Make Our Planet Flat Again – Macron yearns to be more ignorant than a medieval peasant. The attempt to mock President Trump backfires. Democrats and their allies have started blaming their election loss on alleged “Russian hacking,” and bitching about foreign interference in the US elections. How hypocritical! Few days ago, the left-stream media and Obama have raised a ruckus about “fake news,” which they blamed for their election loss. The ruckus boils down to two allegations: a) conservatives produce fake news, and b) conservatives tend to believe fake news. But a closer look proves both allegations wrong. Instead, misinformation is shown to be the province of the Left, and nearly indispensable part of a modern liberal education. Exxon knew (geophysics). Exxon knows. When did knowledge become a crime? This sentence is an almost precise description of the liberal establishment and the Democratic brass today. Obama is gone. Let the rest of them follow.